A dirty martini is a mix of gin and dry vermouth with a small amount of olive juice and an olive for a garnish. You can also get a dirty vodka martini, which uses vodka instead of gin. The calories in your martini will depend on the size of the drink. A 2.5-ounce classic vodka martini has about 156 calories, which is about the same as what you would get from the same size classic dirty martini. Choose a 4.5-ounce classic dirty martini, which is the size often served in bars, and each drink will set you back about 240 calories. 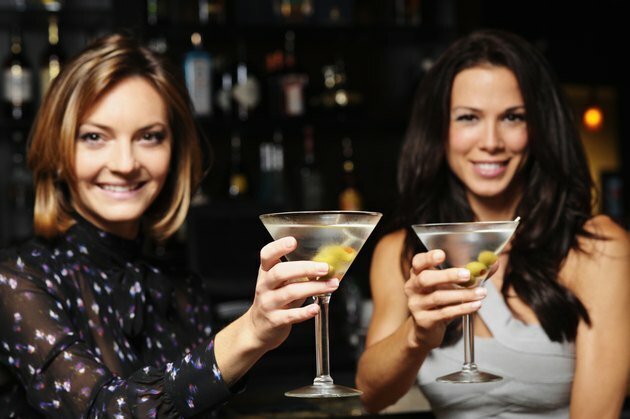 Whether you choose a martini made with gin or vodka won't make a big difference in the calorie count, as both contain the same number of calories per ounce. If you want to save on calories, a 7.5-ounce gin and tonic only contains 170 calories, and using diet instead of regular tonic yields a drink with only 115 calories.